We must admit a fondness here at SCDigest for "future supply chain" sorts of thinking, so we were interested in a new report from Motorola Solutions on From Cost Center to Growth Center: Warehousing 2018. We'd argue that the move to growth center has been around a long time, but nevertheless the new report - based in part on a survey of logistics professionals Motorola conducted earlier this - has some interesting data and observations. 31% of respondents say they are using some form of cross docking currently, a number expected to rise to 45% by 2018. The report starts by noting several trends identified from the survey data. • 35% of companies say that plan to increase their number of distribution centers over the next 5 years, while 38% say they plan to increase the size of their facilities. 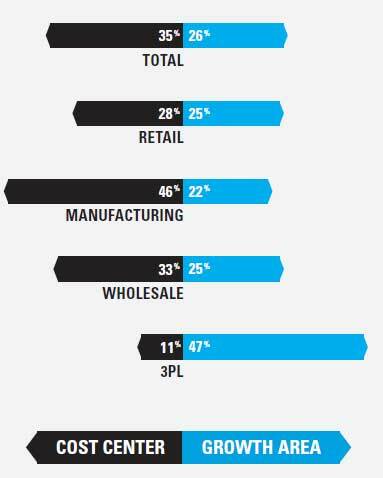 • 54% expect the number of SKUs they carry/manage will increase - only 10.7% expect SKU counts to drop. • 48% say they plan on increasing their use of so-called task interleaving, which involves combining DC tasks in something akin to a "continuous move," such as a putaway move with a full pallet replenishment. • Yet, 51% expect inventory turns will rise, whereas only 7% expect them to fall - that's a tough challenge with rising SKU levels. Obviously, these and other trends will put more pressure on DC operations and likely require a higher level of supporting technology to maintain performance levels. Task interleaving in a large DC can be quite complex to implement effectively, for example, and almost by definition requires a high-end WMS and wireless terminal and/or Voice system for operators. SCDigest has been on the "perfect logistics" bandwagon for a couple of years now (see The Coming Era of Perfect Logistics), and Motorola has been pushing a related concept it calls "flawless fulfillment." Motorola sees four processes areas in distribution that will evolve to drive this type of increase fulfillment perfection. 1. Inbound Handling: The receiving and put-away functions will grow in importance as the first chronological step in streamlining warehouse operations. Changes include growth in the percent of inbound materials that are barcoded, more stringent demands from suppliers to support the receiving process, and increased use of productivity enhancing activities such as cross docking. 2. Storage and Inventory: Paper cycle count processes are on the endangered list as organizations turn to real-time, automated WMS entry, more frequent cadence for inventory validation (instead of just compliance for financial regulations), technology driven efficiencies in cold storage and improved asset tracking and management. 3. Pick and Fill: As the number one priority for most warehouse operations, pick and fill processes are becoming even more automated and more flexible using efficient new procedures such as task interleaving. Major technology changes include the reduction of scan-only or voice only picking and replenishment, giving way to more productive multimodal processes using efficient new handheld and wearable devices. 4. Outbound Handling: In the new warehousing world, customer satisfaction is seen as a major corporate objective and differentiator. Fast and accurate customer-driven requirements are playing a more important role in the packing, staging, loading and shipping functions, taking advantage of processes such as load optimization and performance monitoring. As some further examples, say for inbound processes, 31% of respondents say they are using some form of cross docking currently, a number expected to rise to 45% by 2018. As with task interleaving, the idea of cross docking sounds great, but is often harder to implement in practice, especially outside of retail. The report also briefly mentions an approach to serial number capture Motorola has championed before, which is the use of two-dimensional bar codes for inbound capture of product serial numbers. Few companies do that today on inbound due to the big hit on productivity that comes from scanning every carton received. But the supplier (whether an in-house factory or outside supplier) could often rather easily produce a 2D bar code containing all the series numbers of cartons on a pallet, which could then be captured with one quick scan. In regards to pick and fill processes, the survey found an expected 113% increase by 2018 in the number of companies using "multi-modal" wireless solutions, such as a Voice terminal with bar code scanning capabilities to capture long bar codes such as serial numbers when needed, supplementing the use of Voice to communicate work requirements and receive back confirmations from workers. "The picking and replenishment solutions of the next five years will focus on the adoption of more ergonomic, intuitive, adaptable and flexible technologies designed to enhance pick and fill workflows and position the facility for future requirements," the report says. And about that cost center versus growth center thing - as shown in the chart below from the report, a majority of respondents in every sector except 3PLs, naturally enough, currently believe DCs are cost centers not growth centers. Are Distribution Centers Viewed as Cost Centers or Profit Centers in Your Company? Any reaction to the data in this report? Do you expect to see use of cross docking and/or task interleaving to increase? Let us know your thoughts at the Feedback section below.